for $249,999 with 3 bedrooms and 2 full baths, 1 half bath. 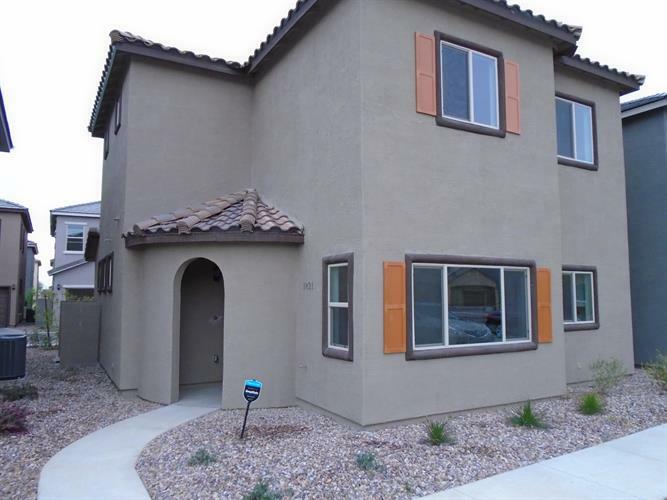 This 1,857 square foot home was built in 2019 on a lot size of 2320.00 Sqft. Move In Ready, New Construction Now Available. This 3 bedroom home boast 9 foot ceilings both first and second floors, great room concept and an energy efficient home. Over 25K in upgrades for a fraction of the cost. Courtyards at Madison ranch is a gated community, with several parks, green spaces, BBQ/Ramada and a community pool. 5 Miles from Downtown Phoenix! Surrounded by the Beauty of South Mountain with hiking trails under a mile away. Upgrades include upgraded tile all first floor, granite counters in kitchen and bathrooms, master shower tile and courtyard area. This home has beautiful views of South Mountain and is a must see.